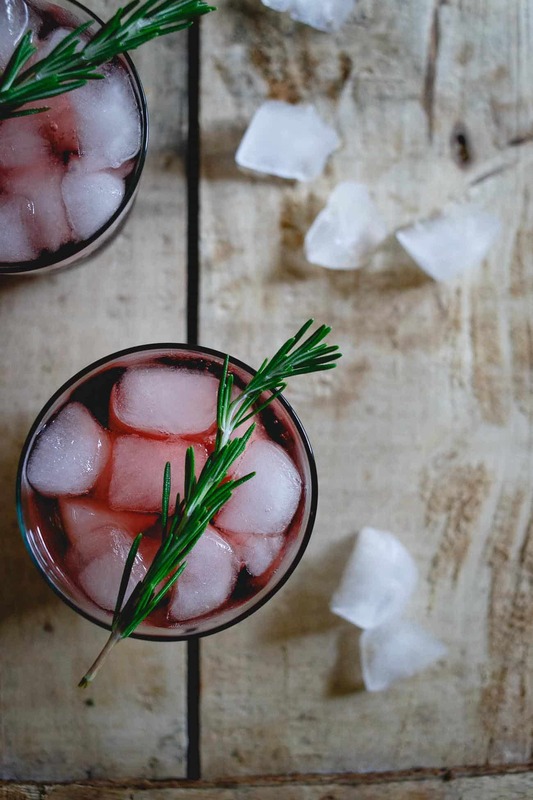 This cherry red wine spritzer is made with tart cherry juice infused with rosemary. 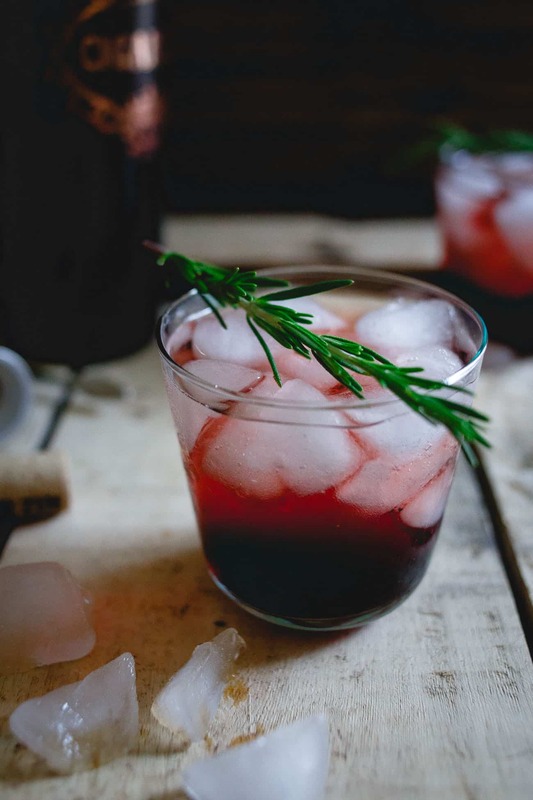 It’s an easy holiday drink or fun way to change up your normal glass of red. Wine spritzers and I go waaaaay back. They may or may not have been the contributing factor to my decision of what college to attend circa Easter 2000. Sprite and a tad too much white wine ended up making that final decision for me at our family holiday gathering and my parents got to witness their 17 (almost 18) year old a tad bit tipsy, getting a peek into what those college years would entail. It’s because of that episode we took an extended break from each other but with the cooler weather (although it was 70 today and snowing 5 days ago, so who knows what’s up with that!) and a bunch of my favorite cabernet in the basement thanks to my parents’ recent trip to Napa, I couldn’t get the idea of this cherry red wine spritzer out of my head. Especially when I was thinking of a pairing for this cherry port pork, one of the EatingWell™ frozen entrées. 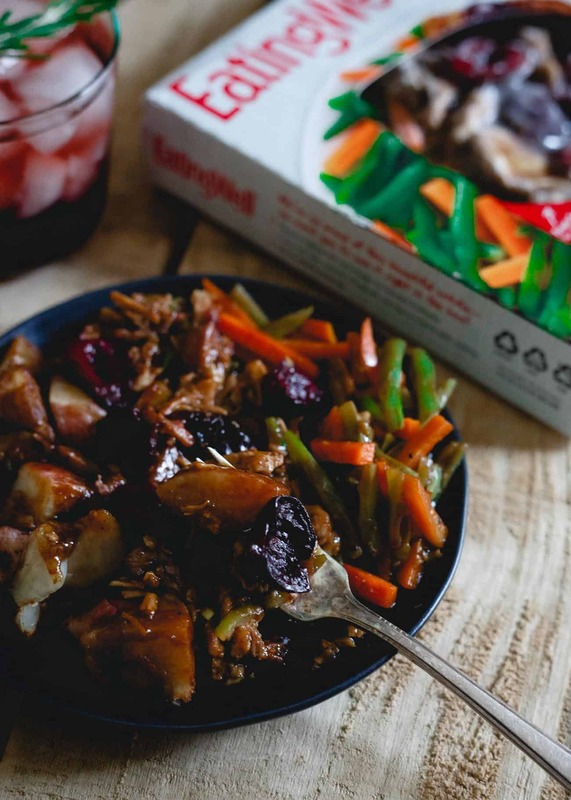 Each of their frozen meals are free of preservatives and artificial flavors, have 1 cup of vegetables and the best part, taste really delicious, not an easy feat in the world of frozen meals! 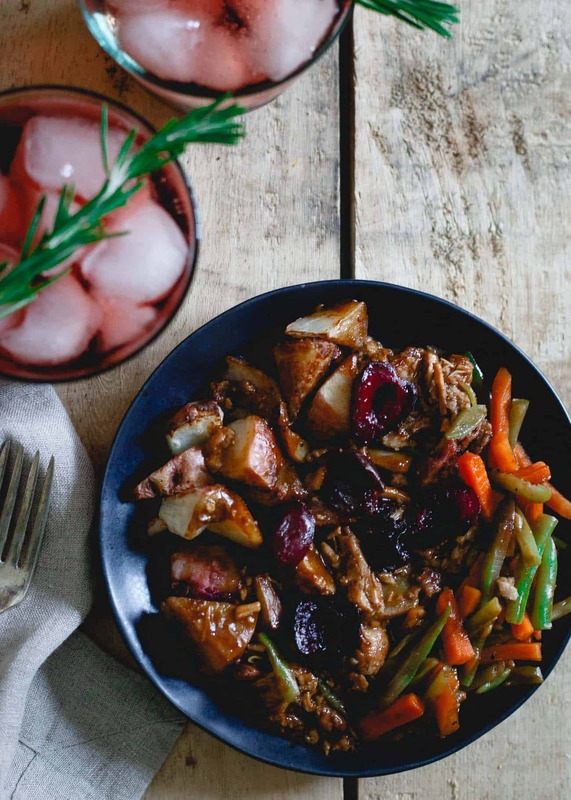 There are 8 varieties to choose from – chicken & wild rice stroganoff, creamy pesto chicken, Indian inspired chicken, Korean inspired beef, Moroccan inspired chicken, spicy Asian inspired chicken, Vermont cheddar mac & cheese and this cherry port pork. The cherries totally sold me on this meal, they just go so well with pork and the cherry red wine spritzer is the perfect accompaniment. The spritzer is also a festive (and easy!) 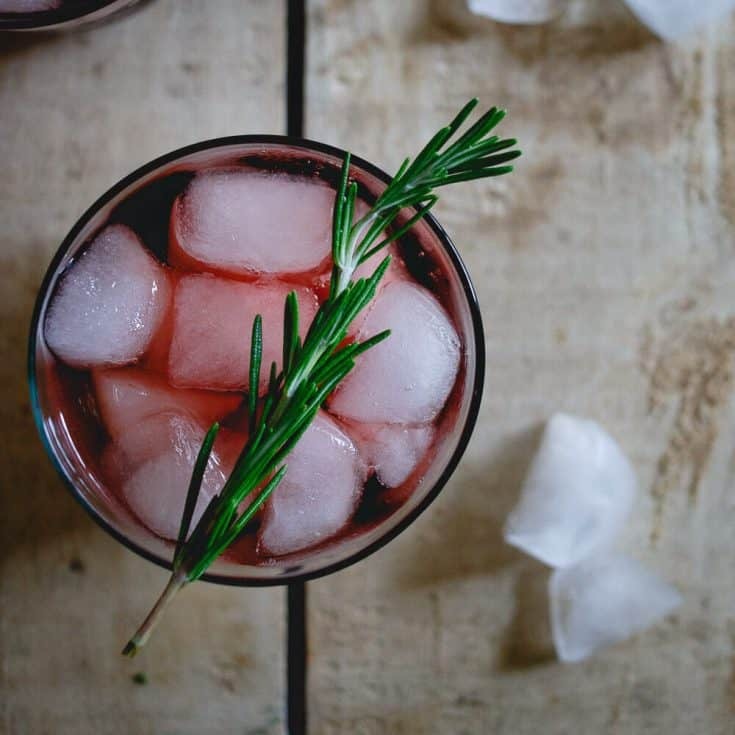 spin to your normal glass of red thanks to the rosemary infusion and would make a great addition to any holiday celebration. There’s enough work that goes into the food part of the holidays, no need for the drinks to be complicated! Although, just make sure there are no major life decisions to be made that day by anyone at the table because these go down a little too easy! If you want to learn more about these delicious frozen meals make sure to check out EatingWell™ frozen entrées Facebook and Twitter and find out where to buy here! Combine the tart cherry juice and rosemary in a small sauce pot. Bring to a boil, reduce heat to a simmer and cook for 10 minutes. Remove from heat and let sit until room temperature. 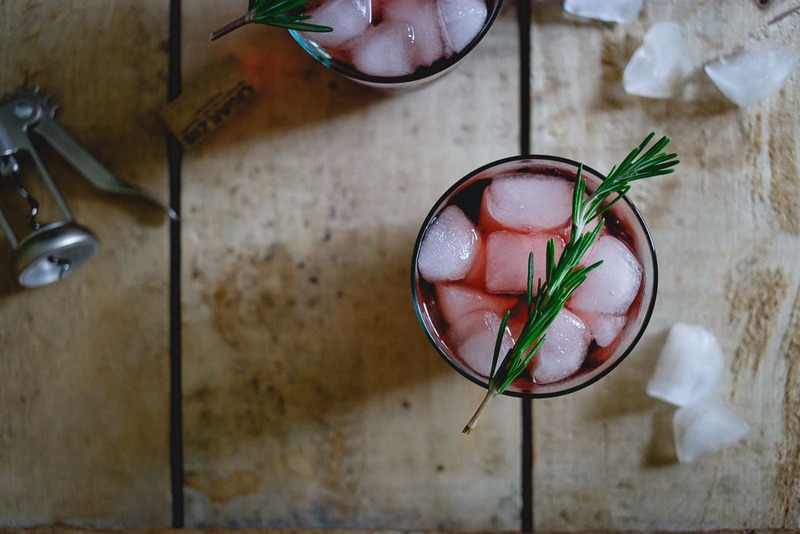 Remove rosemary from the tart cherry juice. Fill 2 glasses with ice and divide the cherry juice between them. You had me at tart cherry!!! I LOVE spritzers!! The perfect holiday drink for sure! Wow! Such a festive little cocktail Gina! Perfect for the holidays!